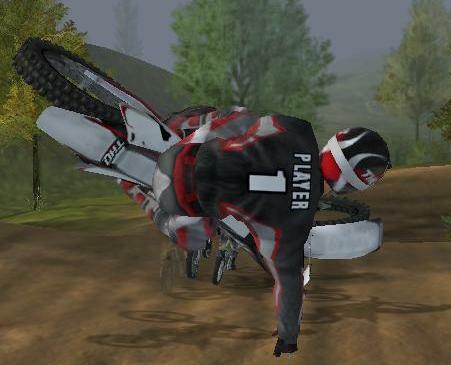 For years, Friday Night Gamers have had the incessant urge to play the games from the Motocross Madness series. FNG carried on with the fine traditions of Motocross Madness 2 until Mid-January 2006, when Rainbow finally released another PC game... a port from their successful "MX vs ATV Unleashed" game on the Xbox and Playstation 2. Now we're bangin' bars again with the old MCM community of yester-year... it's not everything we wanted, but we're lovin' new PC Motocross action, and anxiously awaiting another PC release from Rainbow. How can I play MVA on GameSpy behind NAT/Router/Firewall? Which ports do I need forwarded? You are required to have Ports 1000 and 7001 forwarded to play MVA on GameSpy. How do I pull a BackFlip or 360°? Backflip: Hold the stunt modifier button and do a reverse springload. (Press forward at the base of the jump, and jam it forward at the top of the jump.) Press another stunt button when pulling a backflip to do a backflip with a combo stunt. 360°: Hold the stunt modifier button and quickly press left-right or right-left on your steering control at the top of the jump. Press another stunt button when pulling a 360° to do a 360° with a combo stunt. mxvsatvcentral.com - The site formerly known as motocrossmadness2.com - Thanks to Cameron Graphics (a legend among the Motocross Madness series track creators) for hosting the site. This will be THE place to find custom content for the MX vs. ATV Unleashed. It's also the place where FNGers have been participating in MVA forums. Twisted Dirt - Makers of sik tracks and killer game mods. An FNG Favorite! DaveU is FNG's favorite Track Creator. Go there now and download his ultra cool tracks!